Comodo Internet Security automatically protects COM interfaces against modification, corruption and manipulation by malicious processes. The predefined COM Interface groups can be accessed by clicking the 'Groups...' button. The 'COM Protection' panel allows you to view the list of predefined COM Interface groups protected by CIS, edit them and to add new COM interface components to the list. 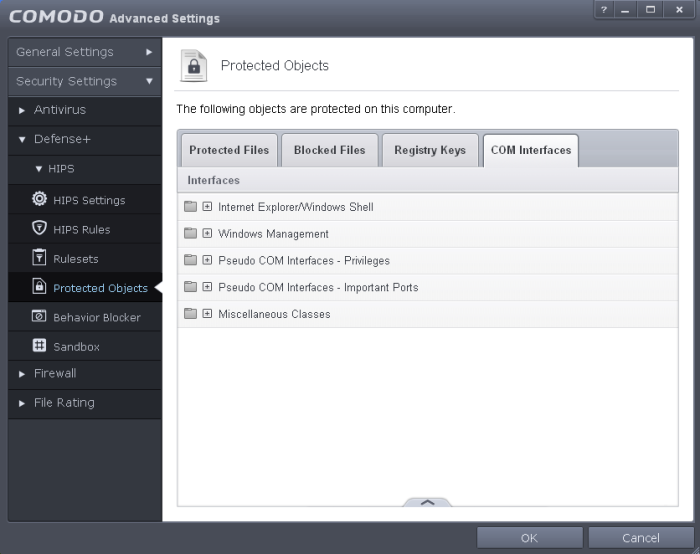 This interface can be accessed by clicking the 'COM Interfaces' tab in the Protected Objects interface. 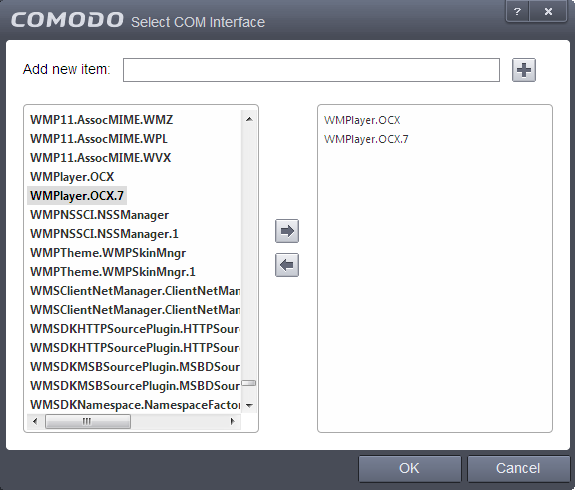 Add - Allows you to add COM groups or individual COM components to COM Protection list. Edit - Allows you to edit the COM Class. Remove - Deletes the currently highlighted COM group or individual COM component from the COM Protection list. Groups - Opens the Manage COM Groups interface that allows you to edit pre-defined COM groups and define new groups for inclusion in COM Protection list. Adding COM Groups - Selecting COM Groups allows you to batch select and import predefined groups of important COM interface components. For explanations on editing existing COM groups and creating new groups refer to the section COM Groups. 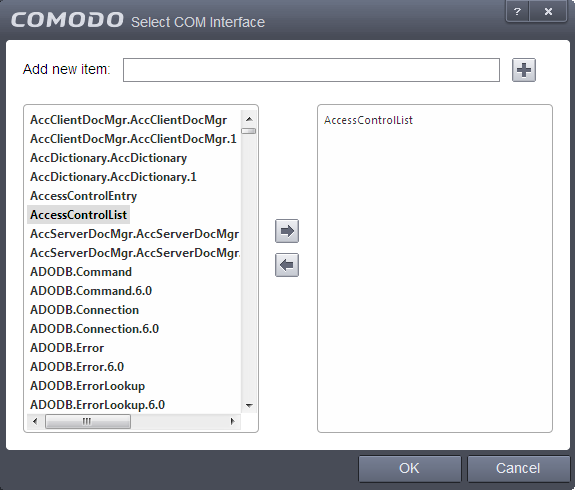 Adding COM Components - Selecting 'COM components' opens the 'Select COM Interfaces' dialog. You can add items by selecting from the left hand side pane and moving it to right hand side pane by clicking the right arrow button. To add item manually enter its name in the 'Add new item' field and press the '+' button. Select the COM component from the list, click the handle from the bottom and select Edit. The 'Edit Property' dialog will appear. Note: The COM Groups cannot be edited from this interface. You can edit COM Groups from the Manage COM Groups interface. Refer to the section COM Groups for more details. Select the item from the list, click the handle from the bottom and select 'Remove'. The selected item will be deleted from the COM Protection list. CIS will not generate alerts, if the COM component or the group is modified by other programs or processes. 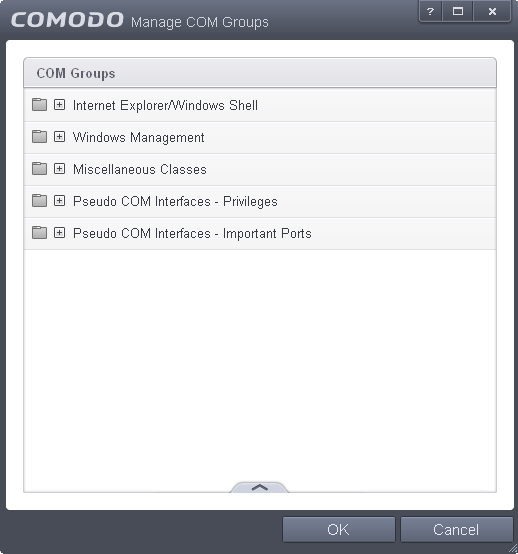 COM groups are handy, predefined groupings of COM interfaces. Creating a COM group allows you to quickly add it to COM Protection list. Click the handle from the bottom center of COM Protection interface and select 'Groups'. The 'Manage COM Groups' interface will open. To add a new group or add new COM Component(s) to an existing group, click the handle from the bottom and click 'Add'. Add a new group - Select 'New Group' from the 'Add' drop-down, enter a name for the group in the 'Edit property' dialog and click OK.
Add COM Components to a group - Select the Group, click the handle and click Add and choose 'COM Class'. The 'Select COM Interface' dialog will be opened. To remove an individual COM Component from a group, click + at the left of the group to expand the group, select the item to be removed, click the handle and choose 'Remove'.